Welcoming our newest pack member, Katie! From May 13th 2019, Katie will be joining our pack and helping walk our lovely dogosaurs. We are very excited to have her on board, she will be a great edition to our pack. She is a proper dog lover (of course! ), and has had plenty of experience handling her own, sometimes challenging, Rottweilers. Although she hasn’t walked a large group of dogs before, the challenges some of her own dogs have posed mean we know she’ll be able to handle a group, especially after 2 weeks of training with Jurassic Bark Boss Sophie! 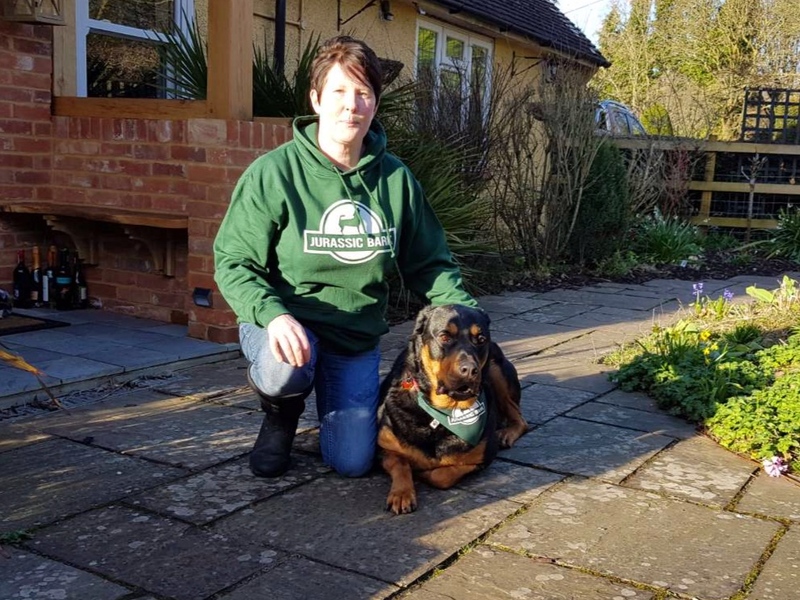 Her current Rottweiler, Busby, is a bit unsure about both people and other dogs, so she has experience handling all 60kg of him when he is reacting to certain situations. Katie has worked as a Chef for the past 30 years and has decided to now follow her passion and join the Jurassic Bark pack. She is super excited for May when she will be officially out with the dogosaurs every day, properly living the dream! She has already joined for a few pack walks, and will be there on the 11th of May for our walk around Newtown, as well as our canine first aid course on the 12th. Katie will be fully insured and canine first aid trained before she is walking on her own, and has a van with customised crates for the dogs’ safety and comfort en route to and from their walks with her. If you live in the area and you think you might need some dogosaur walking help, then get in touch as we will have some extra spaces once she comes on board! These delicious pizza biscuits are nice enough for everyone to eat - both human and dogosaur alike. Yum. One of my favourite things to do with my boys is take them with me for a good pub lunch, or just a pint - even better if we can do a walk beforehand, so everyone is happy! I have compiled a list of pubs I like that allow dogs in the area, hopefully you will enjoy them to! As the weather heats up it's important to keep an eye out for your doggo's temperature as they can suffer from all sorts of issues in the heat. I recently took Aslan for hydrotherapy, not for any medical reason or injury, but because I wanted him to be confident in the water, and do something a bit different that I hoped he would enjoy. Everyone had a fabulous time at our Dogosaur Easter Egg hunt yesterday - canine and human alike! We hid 75 eggs around the park, and had about 25 teams take part. We managed to raise a wopping great big £71.75 for Dogs Trust on the day, so a massive thank you to all that came along and helped make it such a great day. Same again next year? !